Potatoes are undoubtedly among our very favourite vegetables to grow. There’s nothing quite so satisfying as unearthing those tantalising tubers! There are a number of ways you can grow them – each with its own specific advantages. The traditional and arguably most productive way to grow potatoes is in parallel rows. This makes them easy to earth up as they grow using any combination of surrounding soil and organic matter such as dried leaves, well-rotted manure or grass clippings. Chit (sprout) your seed potatoes somewhere cool and airy before planting to give them a head start and encourage them to produce a bigger crop. Plant them in a sunny spot, into soil that’s been enriched with plenty of garden compost or well-rotted manure. You can also tickle some chicken manure pellets or other slow-released organic fertiliser into the bottom of the planting trench. All those organic nutrients will help to nourish the hungry plants as they grow. Set the seed potatoes about a foot (30cm) apart, in rows one and a half to two feet (45-60cm) apart, depending on variety. Plant so that the shoots face upwards. If your soil is nice and loose you may find it easier to simply dig a hole for each seed potato. Earthing up increases the amount of organic matter around the roots so there’s more space for the tubers to grow. It also prevents any that grow near the surface from turning green. Start earthing up once the shoots are up to your ankle, then continue drawing up or laying down material every few weeks until the foliage has filled out between the rows or you can earth up no more. A variation on traditional planting is to use the no-till method. Simply lay the sprouted potatoes on top of the soil surface before covering them with a layer of compost, dried leaves, hay or straw. If you want to use hay or straw, check with your supplier that there’s no risk of any herbicide residues within it. 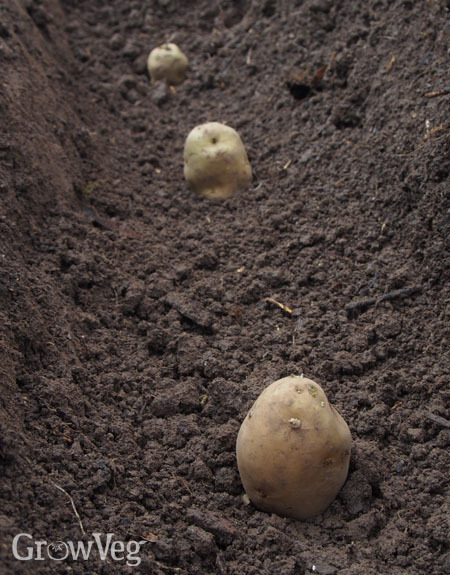 Nestle the potatoes into the soil, then cover with a deep layer of organic matter about eight inches (20cm) thick. If you’re using straw or hay, you’ll need to weigh it down initially – sticks work well. The hay will soon settle down though, creating a mat of material that locks out weeds while keeping the roots nice and cool. Potato shoots are very robust and will have no problem pushing through. There’s no need to hill. When the potatoes are ready, simply pull back the now partially decomposed organic matter to reveal the tubers beneath. Who doesn’t love cheating the seasons to get a super-early crop? If you’ve got the protection of a greenhouse, tunnel or even a cold frame, you can. Set your sprouted seed potatoes into generous-sized tubs or sacks. That way you can plant them up to three weeks earlier than you can outside, so long as you can guarantee they’ll be safe from frost. Choose early varieties if you’d like to try this method. Pop them onto a four-inch (10cm) layer of potting soil then cover to a similar depth. They’re easily earthed up – just add more compost every time the foliage reaches about six inches (15cm high) and keep on going till you reach the top of the sack. Once the weather’s warmed up outside, you can move the sacks outdoors to finish growing. This method works best in cooler climates, where the roots are less likely to overheat. If this happens, the plants will stop producing tubers. Growing potatoes in containers or sacks also works at the other end of the growing season. Plant ‘second early’ varieties in late summer, then bring them under cover as the weather cools down to grow on. This way you can enjoy a really late crop to enjoy throughout the autumn. In milder climates there’s no reason you can’t enjoy your own potatoes even in the depths of winter. Pick a maincrop variety to plant in late spring. When the foliage starts to die back, cut the stems to the ground and leave them be. Then you can simply dig them up at your convenience. They should store in the ground until the second half of winter. All that hard work is worth it when it’s time to harvest your potatoes! Early potatoes, late potatoes, or just lots of potatoes – I hope we’ve given you a few ideas to get started. If you use a different method for growing your potatoes, please tell us about in the comments section below. With spring upon us, the growing season begins in earnest! "Surely the critical issue is soil temperature which you have not mentioned that I can see?" "Yes, soil temperature is very important too. Soil needs to be sufficiently warm enough to plant, so there is no advantage to planting outside too early which runs the risk of damaging the shoots, particularly if it is frosty. The soil shouldn't be cold to touch." "Using the No-till method, do the potatoes form within the composting material, or do they form below the ground. I can't dig much these days and am considering No-till. " "The potatoes would mostly form within or just below the composting material in a no-till garden." "can I grow no dig sweet potatoes under straw, "
"can I grow sweet potatoes the same way, no dig under straw"
"Hi Melanie. Growing in a temperate climate, I'm unfamiliar with growing sweet potatoes. They need a long, warm, sunny growing season, which we don't get where I garden! In theory sweet potatoes could be grown like potatoes, under straw. There are a few websites which discuss growing sweet potatoes in straw bales, so it may be worth trying this technique instead. Good luck with them - and let me know how you get on with them if you decide to give it a go." "thanks ben, I live in north west france not hot like the south but warmer than most. I will try it both ways and fingers crossed I get a good crop. I grew them last year but the only spot I had ready at the time was very shaded and resulted in a poor crop." "Fingers crossed for better results this year Melanie." "I live Central Ohio. This will be th third year of trying to grow potatoes, with very tiny potatoes as a result. We plant in a line, usually in March, wether permitting. It seems, that our plants start dying off in late July early August. Is there a way to keep the plants from dying off so soon? This year, I pu fertilizer around the plants and they’ve grown about o foot since! Just keep fertilizing, to keep the plants going, so those little potatoes growing?? Thanks, Ben"
"Hi Susan. I'm not sure why your plants die off before they've produced a good amount of good-sized tubers. Soil fertility is very important, so enriching the ground with plenty of organic matter in the winter before planting will certainly help. Organic fertilizer as the plants grow will also help, as will ensuring they never lack for water. Hot, dry soil is one of the main causes of tiny tubers - something I've had plenty of experience with in the past! Also, make sure you are planting in fresh ground each year, that way you avoid spreading diseases from one crop to the next. I hope this year's crop is more successful for you." "I've been trying to plant things this year under bark, the potatoes have been great so far, more than enough for two each plant. all my brassicas have been great." "That's brilliant - glad you're having such good success with this technique." "Similar to your potato planting in sacks I plant potatoes inside a tire. When the greens are above the first tire I add another time and fill up to the leaves at the top of the plants with soil. As this layer grows up again I add another tire and more soil fertilizing along the way. When eight tires high or more and the season is finished I take off one tire at a time starting at the top. The potatoes are there right below the top layer of soil and more tubers are revealed as each tire is removed. Ten pounds of potatoes in a tower of tires! Fun!" "I've seen this method in action and it seems to be very effective. Sounds like you get a very impressive harvest using it." "i am growing potatoes in my green house they are in a polystyrene box about 1ft tall by 2ft long will this be to small they are due to be earth up as they have grown 6 inches tall in 2 weeks"
"Hi Keith. Those boxes are probably too shallow to get any meaningful crop. When growing in containers it's always best to go for depth over width. So old bins work very well, for example. Keep going with your potatoes though as you will likely get some tubers, just not as many as a larger, deeper container would give."